In this episode, we talk about Daniel Kahneman’s beginnings with his research partner Amos Tversky, and how he came to realize he was looking at the world from a different vantage point than most. Kahneman talks about his research in human biases, happiness, and risk-taking behavior, and how it has made a dent in many societal sectors. We also discuss how Kahneman’s work is foundational to trading. We get into the relationship between loss-acceptance and risk-taking behavior, questioning the dogma of rationality, bubbles and crowd behavior, why optimism is the engine of capitalism, the influence of prospect theory, and much more. Thought not strictly a trading episode, many of Kahneman’s ideas apply to the world of trading and finance. 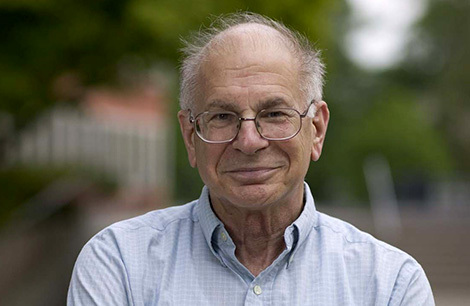 “Not making peace with a loss – this is the downfall of so many investors” – Tweet this Daniel Kahneman quote. MICHAEL: My guest today has been called the most important psychologist alive today. His name is Daniel Kahneman. He is the winner of the 2002 Nobel Memorial Prize in Economic Sciences. Prospect theory, for those of you in the trend following world. Behavioral economics, behavioral finance. He is the guy. He started it all, along with his partner, many years ago. I welcome him to my podcast. I hope you enjoy. MICHAEL: I was looking at your career, looking at all the research and findings, everything behind what you’ve done, and obviously we’re not going to fill it in on this conversation, but at what point in your life did you start to realize that you were comfortable looking at the world, people, behavior, from outside the norm? When did you first realize that you were looking at things from a different vantage point? DANIEL: That’s an extremely difficult question. MICHAEL: I like to give the hard ones right out of the gate. DANIEL: When one does science, of course, you publish things because you think that they’re new. What we didn’t see was how far our research would be taken. So we studied, Amos Tversky and I began our work by studying judgment under uncertainty. Limited sort of problems of judgment. We worked on that five years, and we wrote an article at the end of those five years, in 1974, which was published in Science. That article had a lot more impact and resonance than we had anticipated, and it was really in seeing that reaction that we realized that we had done something that was unusual, because people were reacting to it as if it were unusual. So it was somewhere between 1974 and 1980, we became aware that people were taking it as new, or were taking it as newer than we had taken it. MICHAEL: Interesting. For me, in my world, the world of money and markets, your work is right there – for me, at least, from where I come from – is right there at the foundation. If people were to say to me, “Hey Mike, what’s the best way to learn about making money in the markets or being successful in the markets?” I would point them towards your work. I think it’s one foundational element that if people don’t wrap themselves around the internal themselves, they’re just not going to do very well, and I think you really – I don’t think you intended, perhaps, to have so many people on Wall Street be thinking fondly of your work, but it so happened that way. DANIEL: Yeah. This all really came as a surprise. We had not expected it. I mean, there was going to be some reaction to the assumption that rationality into the dominance, the rationality assumption in finance and economics, it happened that we provided an instrument that people inside the discipline could use to question the dogma of rationality. It’s actually quite – it’s an interesting anecdote how this happened, and the reason our work had an impact, because it’s actually accidental, why our work had impact. It had impact because of the way that we present our ideas, and we present our ideas by examples in the text of questions that people tend to get wrong. So the readers, who are not psychologists, readers outside the discipline, they read this and they face the demonstrations that work on them. And it’s when something works on you that you’re inclined to change your views about human nature. Merely getting data about undergraduates or some other people responding to questions does very little to people. MICHAEL: Yeah, reading about others is one thing, but when you see the change internally on your own self, that’s when the magic can happen. DANIEL: When you see yourself making mistakes or tempted to make mistakes, then the idea that people generally, people who are as smart as you are, are tempted to make mistakes, that’s a discovery. It makes it much harder for people to distance themselves from the findings, and I think that it’s this accident of format that caused our work to have the impact it did. MICHAEL: I want to shift away from your early work to something that’s been near and dear to you recently, and that’s the subject of happiness. I mean, I’m sure it’s always been near and dear to you, but I would love for you to get into something that I think can help people regardless of what they’re interested in in their life, and it’s the idea of the remembering self and the experiencing self. That, out of the gate, might sound very academic to just a regular audience listening, but I think it’s a very important distinction that you’ve drawn. Why don’t you just talk about the experiencing self and the remembering self out of the gate? DANIEL: Sure. There are two types of questions which you can ask people about how happy they are. We can ask them “How do you feel right now? What is your mood right now?” The self that answers this question, I call the experiencing self, because it talks about what’s happening right now. But when you ask people “How was your vacation? How happy were you during your vacation?” or “How happy have you been over the last year?” or “How satisfied are you with your life?”, when you’re asking those general questions, you’re asking for something entirely different. You are asking persons “how do you feel about your life?” Now that you’re thinking about your life, how do you think about your life? How that makes you feel. So how you feel as you are living and how you feel when you’re thinking about your life are two very different questions, and it turns out that you can measure subjective wellbeing in both ways by asking people to report on their experiences or by asking people to think about their life and evaluate it, and different factors turn out to be important for experience and for life evaluation. MICHAEL: But there’s quite a bit of confusion between the two. For example, I think you had a story about taking photographs on a vacation. DANIEL: Yes. We seem to be planning our vacations; in many cases, we plan our vacations as constructing memories for use in later consumptions, and photographs are symbolic of that. But in fact, my argument has been that if you look at it in terms of how much time people spend consuming their memories, then that is a negligible amount of time compared to the amount of time that they spend having experiences. And yet we put a disproportionate amount of weight on the consumption of memories. MICHAEL: Well, I’m sure you’ve observed this; you watch young people today, everyone’s got a smart phone, and it’s a constant taking of pictures of themselves, called “selfies.” It seems like instead of living and experiencing the moment, everyone is trying to capture an artificial moment and capture a memory, but the experiencing is not there. I don’t know – you’ve probably noticed this yourself. DANIEL: I don’t do that, but that’s certainly – the ability to record so many things as they are happening to you must be changing the experience of life, because you are evaluating your experiences as future memories. And in a way, when you’re taking pictures of what you see, you’re adopting a different stance on the experience itself. Certainly, this is having an effect; what effect it has, at least, I don’t know. I haven’t analyzed it. Now, that can have meaning in far different fields, but in my world of trading, of finance and money and Wall Street, not making peace with a loss – this is the downfall of so many investors. And here you’re coming at it – I don’t imagine you were thinking through some of that work with investing and trading in mind, but it’s foundational. I mean, every great trader knows what you just said, that’s like written on the wall in some form or another. DANIEL: Of course, we weren’t thinking specifically of investors, but it turns out there is research that demonstrates this. We know about traders, how they trade in the course of a day, and if they’ve been losing, they take more risks later in the afternoon. So that seems to be – the idea if you haven’t made peace with your losses, that means that you are trying to make up those losses. That tends to make you risk seeking, and we do see a lot of evidence for that. And it probably is costly to traders. In the extreme cases, traders who trade so much that they can’t make peace with their losses; some of them get caught up in cycles of fraud and they become rogue traders. But those are the exceptions. But traders who are not rogue traders do tend to vary in risk seeking depending on the history of what’s happened to them during the day or during the year. MICHAEL: Let me shift slight gears on you and talk about bubbles and crowd behavior. Generally, it seems – I know your research goes there, but that when people get together in crowds, the decision-making changes. DANIEL: Well, yes. What we see is – and that is probably, ultimately, it’s biological. It’s following other people. When you see a lot of people running in one direction, we are by and large wired to run in the same direction. Now, a few very clever people will run in another direction, but the majority of us, when we see the herd moving one way, we move with it. That has large consequences, of course, on market behavior. By and large, what it causes, it causes people individually to do far less well than the markets than they should, because they tend to come in too late when the market is rising. People’s timing is way off, and as a result of trying to follow the herd, they do much less well than they would do if they were basically adopting a policy and sticking to it. MICHAEL: Is there anything else you’d rather be doing in your life than this? I look through your work and the findings, and I just imagine you’re terribly passionate about what you do. DANIEL: Yes. And I do other things. I’ve retired from my academic career, and I now do consulting, which I enjoy just as much as I enjoyed science. It’s been a fun career, and the topic has been fun. When I started out this line of research like 45 years ago with Amos Tversky, this was sheer fun, because he was a very funny person with a lovely sense of humor, and we were laughing all the time. We laughed for about 12 years doing our research. What made it funny was that we were studying our own biases and our own mistakes. Our point was not that people are stupid, because we never thought that people are stupid, and we never thought that we were stupid. But it’s our own mistakes and intuitions we were studying, and that must’ve been the best fun I’ve had in my life, those years of working on that topic. MICHAEL: Yeah, because I assume the two of you were just, to some degree, off on your own island and just doing your thing, and the rest of the world was there, but you were engaged 100% in your endeavors. I’m sure that feeling must’ve been great. DANIEL: Yes, it was. You know, we were friends, and for more than 10 years, I think, we spent about half a day just together talking, which was very unusual in scientific collaborations. So we were extremely fortunate. We liked each other’s company, and our topic was fun. Our topic was one that could be studied while having a fun conversation. That is, you examine your own intuitions, you raise puzzles, you see how the other responds, you develop theories and puzzles and intuitions at the same time. It was great to do. MICHAEL: I watch leaders, often leaders making public policy, and near and dear to you is the topic of happiness that we just mentioned a second ago. But talk about happiness research in public policy. It seems like – I’ll give you the example of you and your partner at that time, and happy to go through this process, and you’re learning and you’re finding all these new things out. But it seems like today, it seems like so many leaders, when it comes to public policy, you don’t ever hear anyone talk about happiness. It’s just left out of the equation. DANIEL: I think that’s not quite right, actually. The study of happiness is an official task within the UK government, and the UK government, the current coalition government, put in subjective wellbeing as one of the objectives of policy and one of the measures of policy. So trying to keep a happy population is rapidly becoming an accepted objective of policy. There have been major international commissions. This is a measurement of happiness, a formal measurement of happiness, is now routine and part of policy in the UK, in Canada, in many European countries. In Australia, things are beginning to move in this direction. And even in this country, there is serious talk of implementing measurements of wellbeing. There are questions about how this is to be done, and whether we are ready for the measurements, and whether the measurement and our understanding of happiness is mature enough to base policy on it. So there’s room for debate about that. But that there is increasing recognition of the role of wellbeing in policy I think is beyond doubt. MICHAEL: Let me go to a few more topics with you. Emotion. So much emotion in individuals driven by possibility and not probability. I think that’s probably intuitive, but it’s not necessarily, when it comes to decision-making, being driven by possibility versus probability. Leave us with some not great results, often, doesn’t it? DANIEL: I suppose that what you’re talking about is hope and fear. When you’re looking at entrepreneurial activity, it is, we have argued, largely driven by optimism, so that when people take risks – at least, that’s my main understanding of risk, is that much of the time, when people take risk, it’s because they don’t know the odds that they’re facing. They’re actually deluding themselves. In my view of risk takers, they’re on the one hand loss-averse. They hate to lose. But on the other hand, they’re optimistic, quite often to a delusional degree, so that they don’t really know the true probability that they face of losing. That’s a combination that produces risk and risk-taking. But it’s mainly driven by optimism. You can see that in entrepreneurs, you can see that in people with discoveries and are trying to bring them to market, you can see that in people who start small businesses. The average small business in the United States, there is 35% survival after five years, as I recall. But most people who start a new business assign themselves a probability of 80% or higher to be successful. So it’s that delusion that keeps them going. I’ve called optimism the engine of capitalism, because it is in that sense very beneficial to society. But many people would not be taking the risks they take if they knew the risk they are taking. MICHAEL: Obviously, you’ve had a major dent in thought and people investigating the issues that you’ve laid out, understanding, believing, knowing it’s true. How much of a dent, though, I’m curious, do you think that something like prospect theory – how much of a dent has it really made in the sense – I mean, obviously, you’ve made a dent, but the acceptance? Because I look at, for example, you could look at the current U.S. equity market right now. I have no idea if it’s fairly valued or not fairly valued, but we can all observe, in the last 15 years, some quite fantastic bubbles and some quite fantastic busts. DANIEL: I don’t really think that the advances in behavioral economics and behavioral finance – and I’m a customer and not a producer of that, and I’m really not an expert, but my impression is that very bright people are working on this, very bright people are trying to develop theory, but it’s early days of behavioral economics and behavioral finance. When you say has it made a dent, well, the answer is clearly yes, because some of the major economics departments and finance departments in the land have behavioral economics and behavioral finance as a central part of their curriculum. The Harvard Economics Department, one of the best in the country, some of the major stars there are behavioral economists, and the best students are going there. Many of the best students are going there. So that you know that it has made a dent, because what graduate students are doing is telling you something both about the recent past and about the near future. The near future, there’s going to be a lot of behavioral economics going, because many very bright scholars are going into the field. MICHAEL: I should probably clarify myself. I obviously was not trying to say it hasn’t made a dent, but I guess I was thinking more about the more established field of economics, the more rational side of the coin, where you’re coming at it from a different perspective. There’s always going to be that conflict between the two. DANIEL: There is. There’s something almost funny about the last Nobel Prizes that were given, because the Nobel Prize in Economics was given to two people, both of them students of finance, with radically different ideas, so that you have Eugene Fama, who was a traditionalist and believes in the rational agent model, believes quite passionately about it and in the rationality of markets, and on the other hand you’ve got Bob Shiller, who speaks about irrational exuberance and doesn’t believe in the rationality of markets. So both of these currents are alive and well within finance. My sense is that there is a lot – that the younger people may be drifting in the direction of behavioral finance, but I’m not sure. This is an impression that I get. MICHAEL: Can I get you to go back to your really early years for a moment – we’ve only got a few minutes left, but I would love for you to go back to as a young man, because I think when people listen to people that have had some achievement in their life and they’ve gone down certain paths, it’s always nice to look back and say “Can I relate to that person?” It’s very difficult to relate to somebody that maybe receives a Nobel Prize, but can you relate to that man as a young man? I’m wondering if you might talk about maybe some of your early experiences, and I think there’s one experience that I believe was in France, and I believe it was with a German soldier, and you walked away from that changed. DANIEL: Yeah, I can tell the experience. It was during the War. I was seven years old, 1941, in occupied France. France occupied by the Germans. They were beginning the measures against Jews. It wasn’t extermination yet, but they were getting ready. So the Jews were supposed to wear a star of David, the yellow star of David, and there was a curfew for Jews. I was a first grader or a second grader, probably, and I was staying with a friend, and I went past the curfew. So I put my sweater inside out and walked home. Then near home, in a place I still remember – this was in Paris – there was a German soldier facing me and walking towards me, and he was wearing a black uniform, which I knew, though I was only seven years old, was a bad one because it was the SS that were wearing the black uniforms. He approached me, and I must’ve been shaking; I don’t remember every detail. But what I do remember is he stopped me, he called me, and he picked me up and he hugged me. I remember being terrified that he would see the yellow star inside my sweater as he was hugging me. And then he put me down and he opened his wallet and took out the picture of a little boy and showed it to me, and then he gave me some money and I went home. It was the complexity of that experience – he was a man who was clearly ready and perhaps eager to kill people like me, but there he was, he has a son, he loved his son; I reminded him of his son. So it was the kind of experience of the complexity of human beings that has guided me. It has inspired, I think, a lot of my work. I’ve been curious about people all my life. MICHAEL: Yeah, I think a lot of people might be envious when they – and I highly recommend them to take a look at some of your books – but it’s such a fun topic to be an observer of the human condition, just to watch people, to observe, and then to find things out that maybe you didn’t expect to see. That’s such a fun process. DANIEL: Oh yes, that’s what I was saying. It has been a fun career. MICHAEL: Well listen, I don’t want to keep you. You were kind enough to take some time out today. I will go ahead and point people to any place you might want – it might just be Amazon – to check out one of your books. I know you’re not trying to sell anything or promote anything. People can go check out Thinking Fast and Slow, is one book. I know there’s quite a few. DANIEL: It really is the only one that was written for the public, and it’s still there. It’s actually on the bestsellers list. It has been since it was published, I think. So it’s easy to get. It’s $2.99 on Kindle. I don’t know why Amazon sells it like that, but that’s how they sell it. Anyway, that’s the book in which I told the whole story of my research and related research with other people. It’s not an autobiographical book. It’s a book about thinking and decision-making. MICHAEL: Well, I love it. I love the topic. I think it’s so foundational to my audience, and I still think there’s probably some people out there that they say, “Mike, you’ve gone off the deep end. Why does this gentleman at Princeton – what is the relevance here?” I think some people just don’t get it, but there’s quite a few that do, and I think they’re appreciative to be turned onto new ways of thought and thinking. I appreciate all your work, and I appreciate you taking the time today. DANIEL: Thank you very much for having me. If you want to learn how to be a trend-following trader, the first place to go is trendfollowing.com. My firm can help you with educational, research, and systems trading packages to get you started immediately. Take advantage of my 15 years of experience. Take advantage of all the insights that I’ve accumulated and put into one research and educational package. These are systems that you can use immediately to start making money. Once again, go to trendfollowing.com. Join over 12,000 others on the Trend Following mailing list. Have a question or comment about this episode? Post it below.